In my quest to support moms who would like to stay at home to take care of their kids, I have often encouraged moms to start a home business that suits their lifestyle. While that is my main passion, I cannot say that I am not aware that there will be moms who do not and would not want to start a home business. 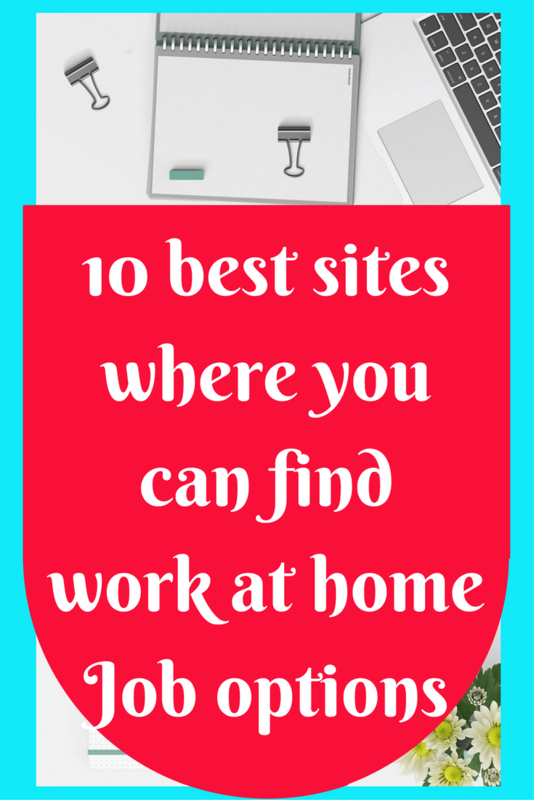 In today’s post, I will be listing some reputable sites who offer work at home job options. I do know that some sites are prone to scams, it’s the duty of anyone reading my post to take time to research your options before acting on them. Working Nomads is predominantly a Job site that curates job openings that have work at home job options, they make it easy for you to apply because all you have to do is register on their site and you get to choose the different categories where you had like to work in. Once you do that, you can then choose how often you can receive the emails for Job openings from them. Enter your email address and you are registered, you have to confirm your email address though before you can start applying, registration is free. Currently, the following companies are recruiting on the platform: VIPKID, Telereach corporate, Booz Allen and co, Tele Tech Just to mention but a few. These companies were listed amongst the top 100 companies that offer work at home Jobs. So I know it’s not a scam. Flexjobs is an online Job curating platform that offers an opportunity to those looking for part time jobs, freelance jobs, telecommuting jobs and work at home job options. They are amongst the highly rated Job platforms because they take the time to scan the employers to be sure they are no scams. Flexjobs is fitting for anyone who wants flexibility in their job schedules and also would love to work from home or telecommute. They cater to people from different levels of career from low-level jobs to professional career jobs. In accessing their job sites they promise, professionalism, the legitimacy of job offers and flexible work options, that’s why they are called flexjobs right? Flexjobs is also named amongst the top ten sites that provide work at home job options. To access the site you have to pay a fee, their fees range from 14.95/month to 49.95/ year. The good thing is if you are not satisfied you can ask for a refund. Flexjobs caters for parents who need flexible jobs due to child care, to retirees who want to work on their own schedules, and also spouses of military personnel who have to move at any time, people looking for second work options to supplement their income. Stay at home moms who want to utilize their skills in other ways. Click here to see current listings. Skipthedrive is an online Job portal that lists work at home job options, they do not require registration of any sort and they do not also collect any fees from their users. They offer a ton of resources for work at home jobs and also makes it easy for you to begin your search. They also offer Job application tracking. Virtualvocations is also an online job curation platform that offers telecommuting job options or Work at home Job options, They tout to have hand screened all their offers to ensure that you get a real work at home job without scams. Registration is free but they also have a paid option if that’s what you seek. Top companies using them include VIP desk, Red visions, Appen, Lionbridge, Linode. Click here for currently open positions. This is an online job platform that offers remote and Work at home Job options to people around the world. Registration for those seeking for jobs is free. It’s a platform that gives the opportunity to start up companies to find great talent around the world for free. They feature about 180+ countries. If you are looking to use their platform all you need to do is to sign up and create your profile on the platform and wait to be discovered or you can apply to actively open positions and set up an interview with the companies. Once hired, you get paid and you keep 100% of your pay, you don’t pay any commissions for the job you get. They provide interactive communication features between the remote workers and the companies they use via instant chat messages, live video interviewing platform, direct emails, and voice messaging. Indeed.com is an online Job site just like the above-mentioned ones, the only difference is that it’s not solely dedicated to Work at home Jobs. It has a section that is dedicated to that aspect though, you will have to type in the keyword work at home for you to find what suits you. Glassdoor is an online Job portal where people can search for jobs, however, it is not dedicated to work at home Job options or remote Jobs alone. If you desire Work at home Jobs, you will have to diligently search for it. The good thing about the site is that you have a ton of resources to help you make a decision; from salary ranges for your job type to resources concerning what is the average that your state pays for that job, that way you are better able to make an informed decision while negotiating our pay. Through their company review system, you can see which companies are the best and which one is not doing so well. A good thing to note before you accept an offer.You need to register with the site to be able to use their site. They have tons of info that will make your search worth it. Remotive is an online platform dedicated to connecting companies to Talents who want work at home Job options or work remotely, it offers a variety of options in the job search. In checking out their various available jobs I found that it indicates if the Jobs being offered are for the US only or otherwise. That way people who are international searchers will refrain from applying. You may need to register with the site so as to get good job leads every week. Remote Ok operated much like remotive, they feature lots of opportunities that are solely dedicated to those who want to work from home or remotely. They are able to categorize their jobs into different industries to make it easier for you to apply. This also an online Job site that charges the employers who will like to list their jobs so as to keep it free for people looking for jobs. They post jobs that are not restricted to a specific location so as to make it easy for employees to apply. Majority of their Jobs are Tech jobs just a fees are nontech so keep that in mind while applying. Do you have more ideas about work at home Jobs? leave a comment below. This is a very comprehensive list. I work from home, too. It would be great to have some more side hustle! Thanks for this post! I am glad you found it useful. Thanks for commenting. Thank you for sharing! It is hard to find legit sources. This is really helpful! Searching for quality work at home jobs can be so tough! I agree with you but if we are diligent, you can get good ones. I will always recommend throwing your suggestions of places you are considering in groups to see if you can get anyone who uses them and has a good report that way you know its real. These resources are amazing! I know tons of people who would live information! Thanks Karen, I will be glad if you can share this resource with them. Such a great resource. WFH jobs can be great, but hard to find good ones. Thanks, Sonya, I agree with you but we can diligently search with the help of recommendations to get good ones. Nice list! Thanks for the info!